In the riveting sequel to the reimagined superhero story The Brokenhearted, Anthem Fleet takes on a powerful new villain and makes some startling discoveries about her family and her past that will forever change her. Taking up where The Brokenhearted ended, the sequel finds Anthem Fleet attempting to return to a normal life after an experimental surgery that left her with a bionic hummingbird heart and a terrifying new strength. But she can’t shake her suspicions about her father’s connection to the Syndicate and she can’t ignore the cries of help in the crime-ridden city of Bedlam. She finds new promise in her relationship with Ford, but after his lifesaving surgery, the Ford Anthem knew slips away. When a mysterious new group called “The Invisible” starts attacking the privileged North Siders, Anthem has to step up and be the New Hope that Bedlam needs, or Bedlam will fall…once and for all. This title was released earlier in the month and I just realized that the story continued recently. 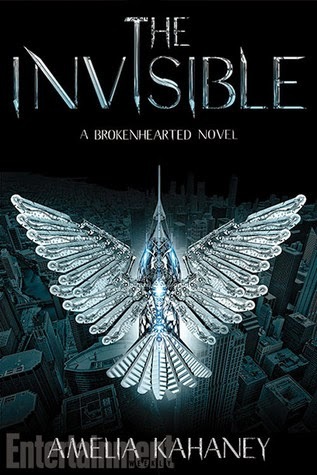 The Invisible is Book #2 in the Brokenhearted series. Its a little bit like Batman crossed with Iron Man and the National Ballet. Anthem Fleet (total superhero name eh?) has a special kind of heart and has become some kind of anomoly. By day she is a normal, highly talented ballet dancer/student but by night she is a midnight vigilante trying to right the wrongs of the world. Sounds fun? It is. Go Girl Power! Ohhh...Curlypow would be so proud!! 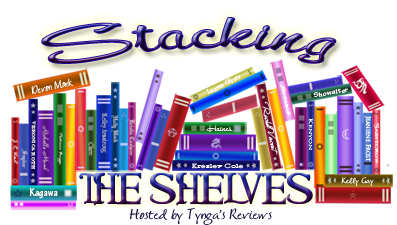 Today's Stacking the Shelves entry includes 3 of the 4 books from the Benny Imura series by Jonathan Mayberry. It is one of Curlypow's favorites. I started reading it years ago but the book was too many pages for me to get through at the time and I had to put it down. 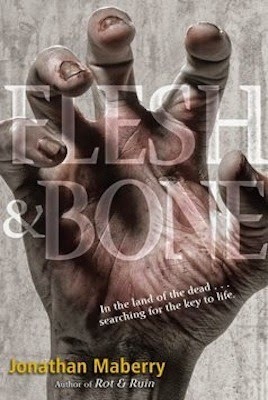 What a great series to start for Halloween eh? EvilLibrarian He’s young. He’s hot. He’s also evil. He’s . . . the librarian. When I saw the title 'Evil Librarian' at work in the catalogue, well I just had to request it, all the while wondering why I hadn't seen or heard of it before. With a title like that, I certainly would have remembered it. 'Evil Librarian' was fun, from start to finish. Cyn is a snarky, kind, normal girl, who loves musical theatre and has a huge crush on Ryan, who just happens to be the lead in the school production of Sweeney Todd. Cyn's asides to herself - and her libido - throughout the story arc are laugh-out-loud hilarious. I love her no-nonsense attitude with a big side of humour. 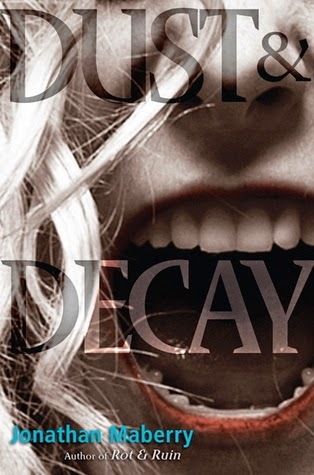 The person she most reminded me of as the book progressed was Buffy (the vampire slayer, of course!). In fact, I'm sure Ms. Knudsen must be a fan. Ryan is an absolute hottie and I would just love to hear him sing. One aspect of his character that i really enjoyed was the fact that he wasn't afraid to say he was scared (?) - a nice change from the usual macho jock-type characters. 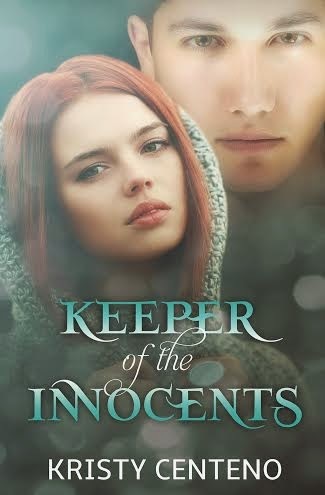 Another aspect I thoroughly enjoyed was the slow simmer of the romance. Even though Cyn is comically head over heels infatuated with Ryan, her transition to the 'real' thing is wonderful to experience. We've got Demons taking over the school and sucking the energy out of everyone and only Cyn and Ryan can stop them. Thrills, spills - sorry football tackles would be more exact - and romance to set your heart aflutter. 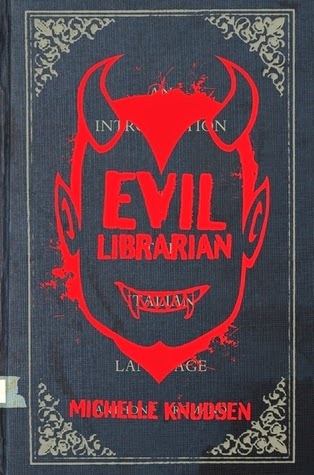 'Evil Librarian' is fun from start to finish. 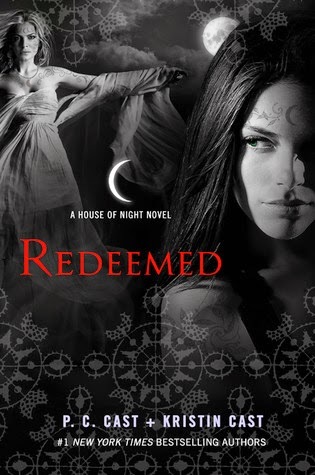 Ms Angelini's Awakening trilogy is near the top of my favourites list, so I have been waiting with bated breath for this new title to come into my library. Happily, with only a couple of minor exceptions I was not disappointed in Trial by Fire. Ms. A's world building is exemplary and she makes it very easy for readers to become completely entranced by her worlds. The main protagonist in Trial by Fire, Lily, is transported from her own world to and alternate universe by another, crueler version of herself and she has to navigate her way through this strange, yet strangely familiar world. She is helped/hindered along the way by Rowan, Tristan and Gideon, two of whom she recognizes from her own world. The reader knows with a certainty that there is going to be a romance here, but it does take a little while to sort out with whom. Now I have to add here that I was a little put off by the language in this new world. Not that it was bad, but that it was idiomatically the same as ours. Somehow, I had a hard time reading (hearing in my mind) Rowan and Tristan saying things like 'yeah', 'OK', 'dad' etc. I realize this is probably just me nitpicking, but I found it very disconcerting for the first half of the book. However, I didn't notice it bothering me as much by the end of the book. There is a lot of excitement throughout the entire bok and this is enhanced by the willstones/mindspeak aspect. BTW, 'willstones' enhance and store a persons natural magical abilities and 'mindspeak' is basically telepathy among those who are claimed through their stones - read Lily. Sorry you have to read it yourself to find out more. 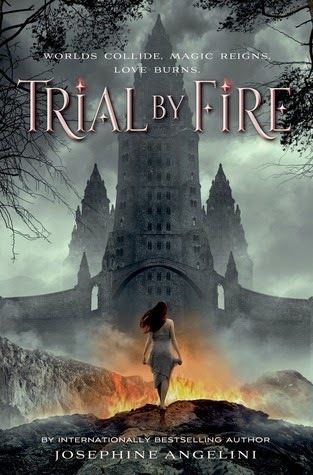 Trial by fire is a fast-paced, exciting and romantic and will have you reading 'til long after dark. I'm sure fans of Ms Angelini will not be disappointed. A great start to a new trilogy. Hmm...this is a hard one because oftentimes the storyline changes once a character is offed. It sets the mood for future events and can be a catalyst for what is to come. That being said, I really wish Dumbledore didn't die. He was such a great role model for Harry and his friends. However, if he hadn't passed, the story would have also had a much different outcome and may not have been nearly as epic. 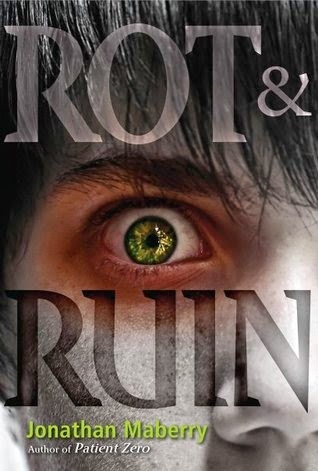 Just to add my 2 cents worth, I would pick Tom from the Rot and Ruin series. He was such a wonderful character and his death was devastating (sorry if that's a spoiler), but by dying he forced the other characters to grow in so many ways. I shed several tears when he died. 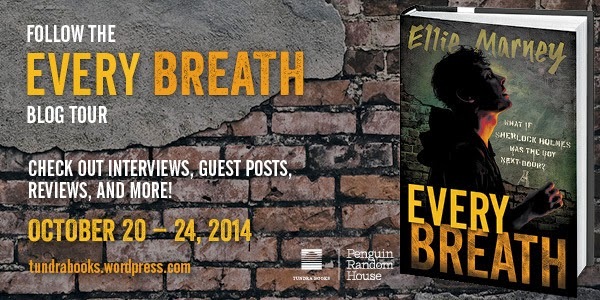 Welcome to the Every Breath Blog Tour hosted by Tundra Books! 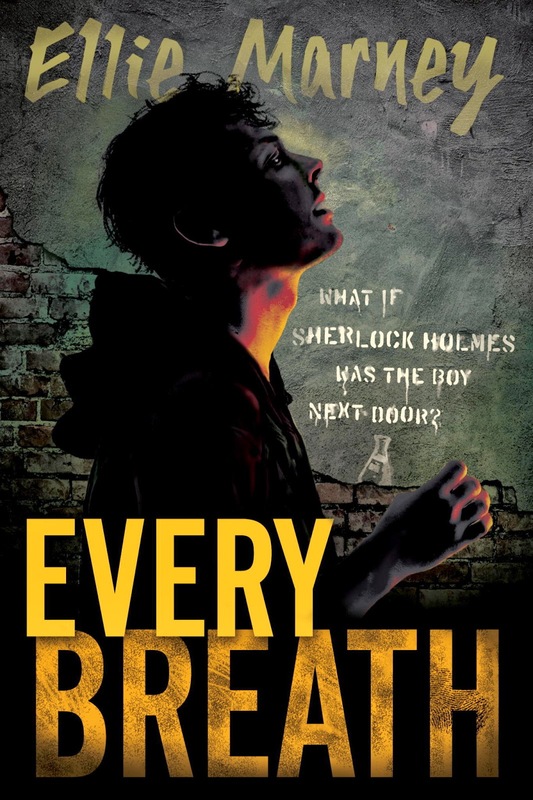 This stop with the Paperback Princesses will feature an interview with Ellie Marney, author of Every Breath. A huge thank you goes out to Tundra for including us in your blog tour as well as Ellie for taking the time out to answer a few questions. When James Mycroft drags Rachel Watts off on a night mission to the Melbourne Zoo, the last thing she expects to find is the mutilated body of Homeless Dave, one of Mycroft's numerous eccentric friends. But Mycroft's passion for forensics leads him to realize that something about the scene isn't right--and he wants Watts to help him investigate the murder. Ellie is quite an interesting author. She resides in Australia but has lived all over the world. She currently lives in the country and has been working hard on the Every series. Hi Ellie, and welcome to The Paperback Princesses! At the moment, though, I’ve got a couple of books on the go, which is my usual way unless I come across something that really compels my total attention. I’m deep in 18th century Scotland right now with the third Outlander book, Voyager by Diane Gabaldon, and I’ve started Jasper Jones by Craig Silvey. 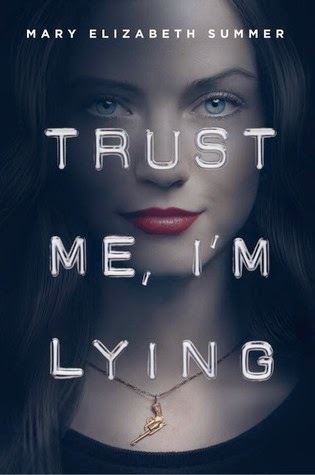 I’m keenly waiting for the next book by Graeme Simsion (The Rosie Project) too – The Rosie Effect has just come out, and I’m a bit desperate for it! I also dip in and out of books I’ve already read, usually when I’m keen for a comfort-read, or I want to recapture a feeling or a tone that inspires my own work. I usually have a pile of books that I pick up and read a few pages of from time to time – the current pile on my desk is getting quite high, and holds books by Honey Brown (a fantastic Aussie author of psychological thrillers), Felicity Castagna (The Incredible Here and Now), Melina Marchetta (The Piper’s Son), Katie McGarry (Take Me On), Holly Black (Black Heart) and Helen Garner (who is an Australian writer of beautiful non-fiction and memoir). Where do you write? Do you have a particular spot where inspiration hits? I used to write in cafes, when my children were small. 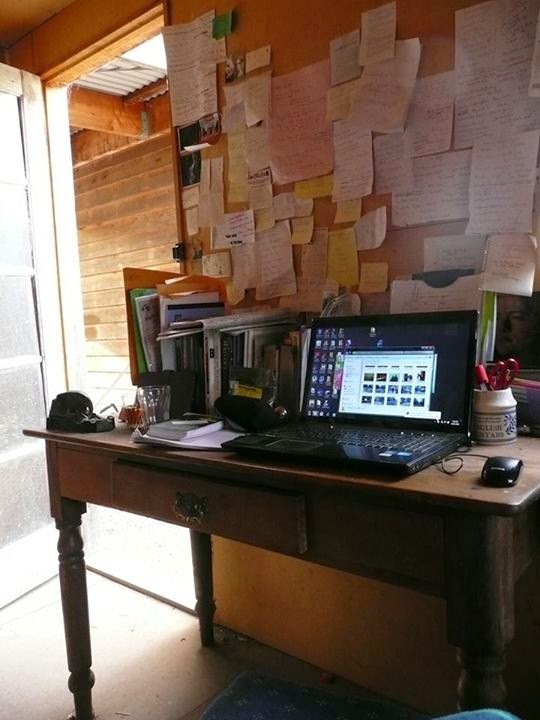 For the last few years I’ve been writing in a little study room that’s squeezed into our shed – it’s pretty basic there, and unfortunately it also tends to be used as a place to store random junk. Hey, there is no judgement where creativity is concerned!! I used to use a Rubbermaid tote as my desk...and it doubled as my "closet" for stationary and my laptop! Where did you come up with your character's names? The pair - Mycroft and Watts just rolls off your tongue. Well thank you! Mycroft’s name is fairly easy to understand – it’s the name of Sherlock Holmes’s older brother, who is described as being ‘much smarter’ than Sherlock but too lazy to put his skills to use in any investigatory capacity. Mycroft’s full name is actually James Whelan Mycroft. I really don’t know where Whelan came from – it just seemed to fit, and I imagined that it was a family name, the way some names are passed down through generations (my husband has something like that in his family). James was a name that seemed to pair well with Mycroft – but interestingly enough, while researching Every Breath I discovered that actually it was Sherlock’s nemesis who owned that name: Dr James Moriarty. So in some respects, Mycroft is his own worse enemy! As for Rachel Watts…well, that is a funny one. I think the name Rachel just came to me as her voice started speaking in my head – some characters seem to name themselves, in that way. Her brother, Mike, sometimes calls her Rache for short – and again, in one of those weird kismet things, I remembered a long time later that ‘Rache’ is German for ‘revenge’, and was actually referenced as a clue in one of the Sherlock Holmes stories, A Study In Scarlet! Watts was a name I had to really search for. I wanted something that sounded like Watson, but wasn’t so excruciatingly obvious. I was on a camping holiday and madly scribbling down names and crossing them off…I think Weston was one of the names that came up as a possibility. Then I was sitting in the car on the way to the beach, and I remembered the character of Watts, from Some Kind of Wonderful (directed by John Hughes), and I thought that’s it! If you haven’t seen that movie, btw, you should – it’s totally awesome, and there’s more than a little bit of drummer-girl Watts in Rachel, I think. Well, if I was allowed to include dead writers, I would have to say William Shakespeare – he’s a bit like the writer’s god, and I went through a phase after high school when I read all his plays and poems, madly falling in love with each one in turn (although Romeo and Juliet is still my favourite). Living authors only would be harder, there are so many I admire… But actually I’d love to meet Stephen King. He’s always been a bit of an idol of mine, and I would love to actually meet him one day (and hopefully I wouldn’t turn into a stammering idiot talking to him). I know you like mangoes and avocados on toast but what are galahs? I should clarify that statement about food – I love mangoes, and I love avocado on toast, but not mangoes and avocado on toast together! 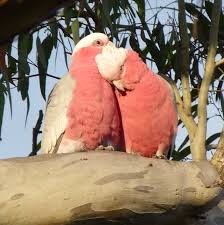 Galahs are the loveliest birds we have here in Australia, in my opinion. They’re a type of parrot, with gray feathers and this beautiful pink tummy, and they make a strong calling cry. We have loads of them living on our property here, and have fostered a few baby galahs that we’ve rescued after they’ve fallen out of the nest. One word...everyone say it with me now....awwwww!!!!! Will you be doing an in-person book tour? And if so, where will you be? Our followers are from all over the world. Maybe there are some in your area! I would love to do an in-person tour! That would be a bit of a dream come true… But I would have to talk to my publisher about it (*nudges Tundra Books*)! I am actually thinking of coming to the US for BEA next year, when the second book Every Word is due for release, although that is still a wish and not a reality yet. If it actually happens, I will most definitely let you know! And hi to all your followers – if you’re living in Victoria, Australia (anywhere near Melbourne or Castlemaine), be sure to look me up next time I’m around! Thank you so much for taking the time out to chat with us! Can't wait to dig into Every Breath!! Really hoping that Tundra will bring you out for BEA 2015! Would be wonderful to meet you!! Congrats on Every Breath and best of luck!! It’s been a total pleasure! Thank you, for having me over for a chat on this amazing blog tour, and I hope you enjoy Every Breath. Have a great week! , only they spend the last year of their lives executing exciting and dangerous missions to make the world a better place. With nothing to lose, Cam is in. A helicopter flies Cam to a secret tropical location, where he’s tossed out with a parachute and an instruction manual. After a rough landing, he meets his nine teammates. The other terminals don’t seem sick; Zara is beautiful, Donnie is an amazing athlete, and Calliope sings like a bird. He soon learns that they’re enhanced with an experimental super steroid TS-8, which suppresses their illnesses’ symptoms and heightens their physical and mental abilities. It’s also fatal if taken for more than a year. 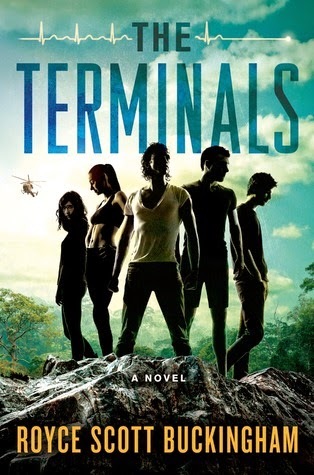 Cam joins this extreme spy team, and they begin pulling dangerous operations in multiple countries. As his teammates fall around him, he starts to receive cryptic messages from a haggard survivor of last year’s class hiding in the forest. She reveals that the program isn’t what it seems, leading Cam to question whether any of them are really sick at all. What I like about the sounds of The Terminals is that it is a good, hearty action boy's read. I'm just curious who will read it first? Curlypow or myself? Keep your eyes open for my review coming in a couple of weeks. group in a yearly ritual. to-be husband—and return the Westfall family to power. be found reading, running, or shoe shopping. A plague of epic proportion sweeps the globe, leaving less than one percent of the world’s population immune. Among the living is Autumn Winters, the teenage daughter of a famous actress. 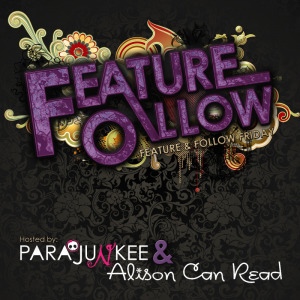 When Autumn’s parents don’t come home and the city is overtaken by a dangerous faction, she goes into hiding with a small group of underground survivors. They’re led by a mysterious young man who harbors an unearthly secret, and with whom Autumn feels a deep connection. 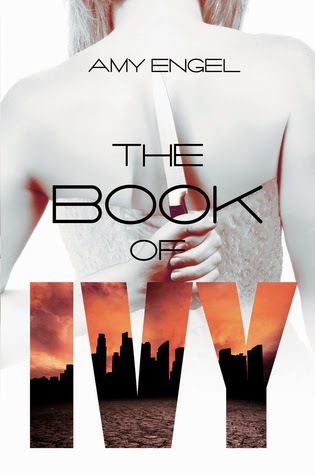 Kirby Howell's Autumn Series is available on Amazon! The Autumn Series is a young adult trilogy of novels written by Kirby Howell. The series follows the adventures of seventeen-year-old Autumn Winters after an apocalyptic plague decimates the planet. Autumn is forced to grow up quickly when her parents don't come home, and she must decide who she can trust and who she should run from. Kirby Howell is the pen name for Jessica Kirby Alexander and Dana Howell Melton, who have been writing together since 2000, when they met at The University of Alabama. They've dedicated the past four years to The Autumn Series and are proud to announce the first two installments are available in both paperback and Kindle editions on Amazon! When we were young adult readers, books by Ann M. Martin, Judy Bloom, Beverly Cleary, and Christopher Pike were popular, though, these books only made up a fraction of our page-turning hours. Douglas Adams, Roald Dahl, Jane Austen, Robert Heinlein, and Laura Ingalls Wilder, amongst others, captured our attention and inspired us not only to want to be like the characters in their books, but to create characters with similar attributes that might inspire others in the same way. You’ll find a bit of Arthur Dent, Ford Prefect, Kristy Thomas, Mary Ann Spier, Elizabeth Bennet, Charlie Bucket, Matilda, Ramona Quimby, and Laura and Mary Ingalls (and even a bit of Pa Ingalls!) hiding inside the characters of The Autumn Series. By writing for young adults, we hope to pass on the inspiration and courage we gained by reading such great works. There is no better age to teach the lessons of integrity, bravery, tenacity, the value of true friends, and the bonds of family. 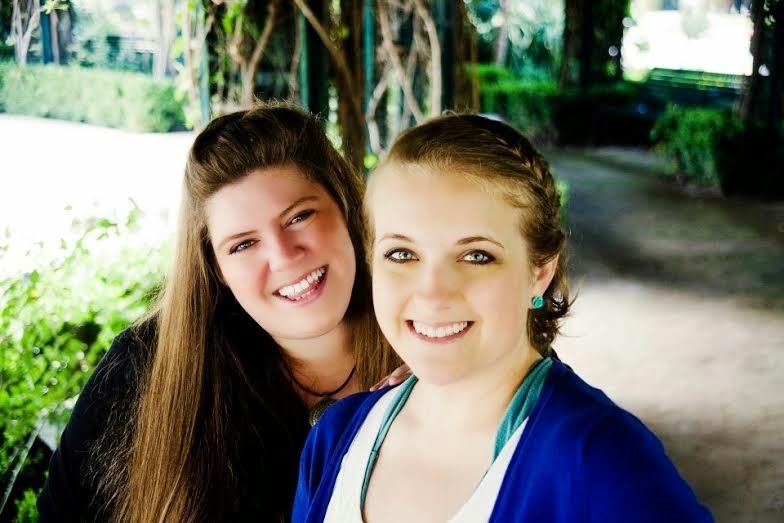 Dana Melton and Jessica Alexander, who write under the name Kirby Howell, have been writing together since 2000 when they met as freshman in their first script writing class at the University of Alabama. Dana, a native Southerner, quickly showed Jessica the ropes and the joys of living below the Mason Dixon Line. Having lived in nearly every other part of the country, it didn’t take Jessica long to acclimate to sweet tea, grits and football. Four years later, with a couple of film degrees under their belts, they moved to Los Angeles to pursue their professional writing careers. We asked Christy why she writes for a YS audience. Young adult is one of my favorite genres to both read and write. And even though I write other genres, YA is definitely my favorite. I’m often asked why I write YA. Well, aside from being the age where most rites of passage begin, it’s also an important stage of our lives and often times these years turn out to be the most difficult period of our existence. During our teenage years most of us learn or at least try to learn, where we’re going. We try to figure out who we are and what we’re meant to do. Where we stand. We learn about responsibilities and how to take them seriously. How to accept right from wrong. Although I’m an adult—having left my teenagers behind some ten or so years back—this self-discovery battle is one I struggled with myself and when I read a young adult fiction, identifying with characters who are often struggling with something in their lives comes naturally to me and I tend to transmit my own feelings in my writing. One of the reasons I enjoy writing young adult fiction is because it allows me to be challenged by the characters. Often times, teenagers are a lot more open about trying new things, having different experiences, exploring, delving into things they shouldn’t just to see where they end up and I like to push this aspect of their personalities without being extremely graphic. Ultimately, YA is a huge part of me as well. 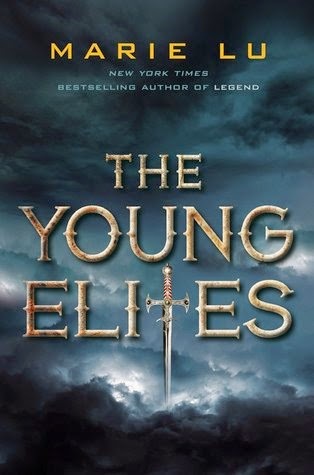 I’ve been reading YA fiction for as long as I can remember and I feel like I’m tied to this specific genre because a part of me is still young inside. When I started putting together the ideas for my first book, the first thing that came to mind is that my story would definitely fall into this category and even though it wasn’t my plan to continue the trend, I felt compelled to continue writing YA fiction because I have a deep appreciation for it. Although I read other genres, YA is my first choice even when I’m shopping for something new to read or write. Though my reading list includes many genres, when it comes to the voice that identifies me the most there’s no other than young adult fiction. So, in case it wasn’t clear, I write YA because I have a deep passion for it. On a warm summer morning in North Carthage, Missouri, it is Nick and Amy Dunne's fifth wedding anniversary. Presents are being wrapped and reservations are being made when Nick's clever and beautiful wife disappears from their rented McMansion on the Mississippi River. Husband-of-the-Year Nick isn't doing himself any favors with cringe-worthy daydreams about the slope and shape of his wife's head, but passages from Amy's diary reveal the alpha-girl perfectionist could have put anyone dangerously on edge. 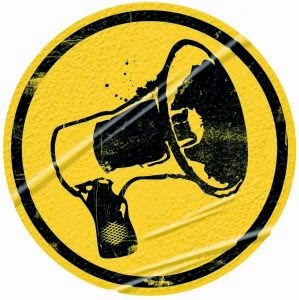 Under mounting pressure from the police and the media--as well as Amy's fiercely doting parents--the town golden boy parades an endless series of lies, deceits, and inappropriate behavior. Nick is oddly evasive, and he's definitely bitter--but is he really a killer? 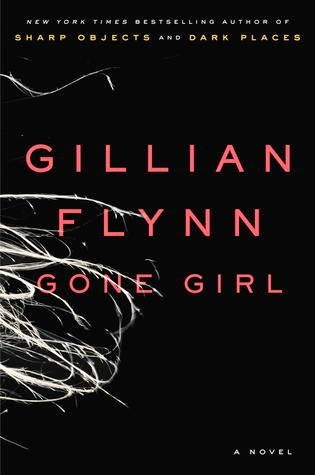 So Gone Girl starts out as a mystery. 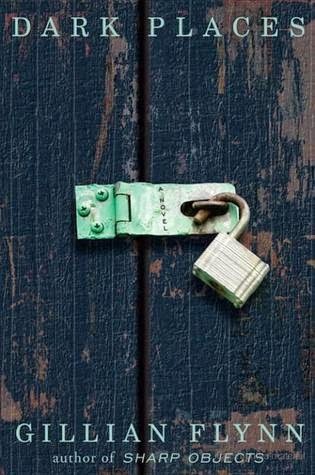 A man's wife disappears on their wedding anniversary and no one knows what has happened. It looks like foul play but we slowly start to see the course of their lives unfold and how this "wreck" of a marriage has started to unravel. There are layers and layers of resentment, guilt, betrayal, blame...all piling up like a car crash on life's highway.